BROOKLYN, N.Y. (CNS) — During a trip to Central America in December, Brooklyn Auxiliary Bishop Octavio Cisneros visited Guatemala and brought with him relief funds donated by Catholics of the U.S. diocese to help survivors of last June’s volcanic eruption. The Diocese of Escuintla, in south central Guatemala, was devastated by the June 3 eruption of the Volcano of Fire (Volcan de Fuego). It destroyed entire villages, leaving more than 100 people dead and nearly 200 missing. In an interview with The Tablet, Brooklyn’s diocesan newspaper, Bishop Cisneros said he made the trip as an envoy of Bishop Nicholas DiMarzio “to bring the monies collected by the generosity of the faithful of the Diocese of Brooklyn” for relief efforts in Guatemala. He presented Bishop Victor Hugo Palma of Escuintla with a check for $78,500. Caritas, the Catholic Church’s charitable aid agency, and the Escuintla Diocese have provided for these families since the catastrophe, according to Bishop Cisneros. The sisters in the shelter take care of the children while their parents are at work. Bishop Cisneros said that he could feel a sense of hope for the future even in the middle of such a difficult situation. 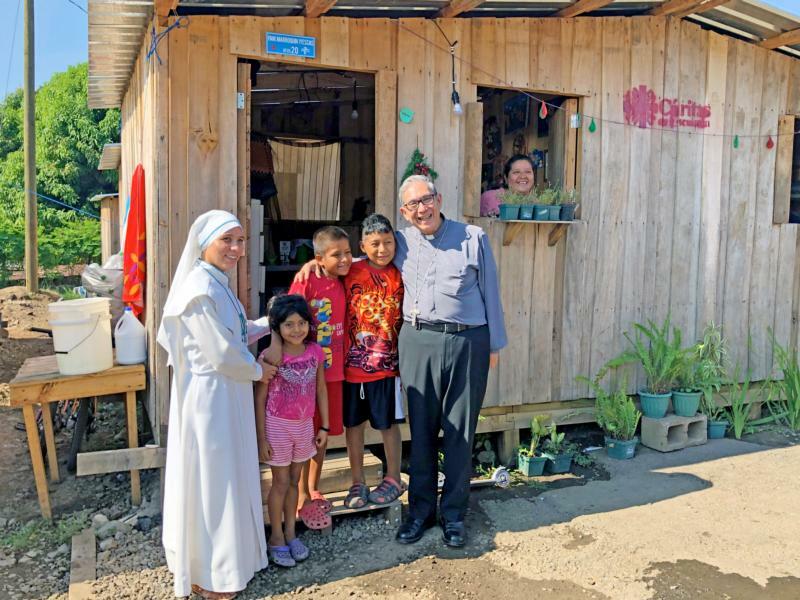 To find a permanent solution for the families, Escuintla’s bishop bought a parcel of land and the diocese is building permanent homes for them. The new houses are being built with concrete cinder blocks and are farther from the dangerous zone near the volcano. According to Bishop Cisneros, the cost is about $12,000 per home. Bishop Cisneros also was visiting Guatemala as consultant to the U.S. Conference of Catholic Bishops’ Subcommittee for the Church in Latin America. He and Trinitarian Father Juan Molina, director of the U.S. bishops’ Office for the Church in Latin America, visited the Diocese of Solola and the Lake of Atitlan, where there is a diocesan seminary that receives aid from U.S. Catholics through the USCCB’s yearly collection for the church in Latin America. They also visited the Archdiocese of Guatemala where they met Bishop Raul Martinez Paredes, the apostolic administrator of the archdiocese. The last stop of the trip was a visit to the apostolic nunciature where Bishop Cisneros and Archbishop Nicolas Thevenin, papal nuncio, discussed the purpose of the visit and other issues regarding the Catholic Church and the people of Guatemala. Dominguez-Lopez is editor-in-chief of The Tablet, newspaper of the Diocese of Brooklyn.